Cut to the chase: No, MLM is not a legitimate business model. It is a scam. It is a pyramid scheme. The heat has been on multi-level marketing companies lately, most notably Mary Kay Cosmetics, the focus of Virginia Sole-Smith’s article on the pink pyramid scheme. One of the common defenses of multi-level marketing is that it is a legitimate business method that has been around for a long time. I’ve also been told that if it was illegal, it would have been shut down. Neither the length of existence nor the lack of law enforcement action means something is legitimate or not a fraud. Remember Enron? Remember Bernie Madoff? These and others have been in business for a long time, and turned out to be complete frauds. Participants secure and advance to ranks or positions in a pyramid (“downline”) of participants based on timing and recruitment, rather than on merit or appointment. As endless entrepreneurial (or “opportunity”) chains, MLMs assume infinite markets and virgin markets, neither of which exists in the real world. They would be doomed to eventual market saturation and collapse, except that some avoid this by expanding to other countries and/or re-pyramiding through the same markets with new product offerings. As endless entrepreneurial chains, MLMs are inherently flawed, deceptive, and unfair – profitable primarily for those at or near the top (top-level “upline”, or “TOPPs”, for top-of-the-pyramid promoters) – who are often the first ones to join. Worldwide feedback suggests that MLMs can be extremely viral and predatory. As endless chains, MLMs quickly spread from state to state and often to vulnerable foreign markets. I have challenged regulators to identify any “business opportunity” that is systemically more unfair, deceptive, viral, and predatory than MLM. None have met the challenge. MLMs typically finance their operations from purchases by participants who are incentivized to buy products to qualify for commissions and to advance to higher levels in the pyramid of participants. With the exception of some party plans, the majority of sales are typically to participants. Typically, MLM products are unique (making it difficult to compare with alternative products), consumable (to encourage repeat purchases), and priced higher than products sold elsewhere – to pay commissions on many levels of participants. 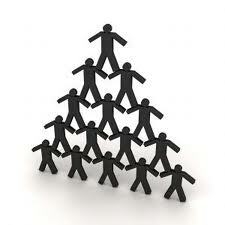 In MLMs, most of the commissions are paid to those at or near the top levels in the hierarchy of participants (TOPPs). It is this extreme concentration of commissions paid to TOPPs that motivates them to work tirelessly to expand downlines, thereby assuring the MLM’s survival and growth. They also must continually recruit to replace dropouts due to high failure rates. Most MLMs become even more top-weighted with five or more layers in their compensation plans – more than are functionally justified. Commissions would be paid only on sales to non-participants – and no overrides or commissions for personal consumption of participants. Most (over 50%) of the commissions and bonuses paid by the company would be paid to the front-line person who sells the products, with amount of commissions decreasing at each higher rank level. The number of levels on which commissions can be paid would be limited to four (the maximum needed to manage any standard sales function, including branch, division, regional, and national managers). There would be no minimum ongoing purchase requirements to qualify for commissions or rank advancement. Unfortunately, to my knowledge, none of the MLM founders have taken such steps to achieve honesty and fairness. The villain in MLM abuse is not so much the leaders as a flawed system built on endless chains of recruitment of participants as primary customers. MLMs enable the transfer of money from a rapidly churning supply of new recruits to TOPPs, founders, and the company itself. MLM promises what it cannot deliver. To be successful, MLM promoters depend on a litany of deceptions, including much self-deception. Misrepresentations regarding products, income potential, and legitimacy are commonplace in MLM. I don’t think that any reasonable person can read the above and still believe that multi-level marketing is an actual and legitimate business method. Yes, there are people who profit in MLM. That includes the organizers of the schemes (owners of the MLM companies) and a handful of upper level participants. But the profit of those does not make the scheme a business. Far from it. How is an MLM different from a traditional employer? I provide value to my employer and he pays me. The guy at the top gets rich off the “pyramid” below. I’m not saying there is anything wrong with the traditional employer-employee relationship, I just see little difference in the pyramid. MLM is not like a real job because (a) it is pay to play and (b) it requires continuous recruiting of people who must play to pay. (And you’re recruiting competitors for yourself.) Read the article. It details why MLM is a scam and not a legitimate business. I agree with you. I have been approached to sell everything under the sun but my answer is ALWAYS no! I know people who have sold everything under the sun and in the end they’re lucky if they break even when it’s all said and done. The income is far from “life changing”, being an “adequate” income for a part time hobby would be a stretch. Steve- with a job you’re being paid to perform a task. With an MLM you’re paying someone else for an “opportunity” that does not come with a guaranteed income (even though they usually claim that it will). If you haven’t seen it, you need to watch the movie “Believe” on Netflix; it’s a satirical mocumentary about a MLM organization called “Believe.” I laughed the whole way through and thought you would enjoy it. Later! Pingback: Fraud Files Forensic Accounting Blog » Is Multi-Level Marketing a Legitimate Business Method?